SEOUL, Sept. 5 (Yonhap) — The nation’s top professional baseball league announced Wednesday it will halt the practice of a midseason break during the Asian Games starting with the next competition. The decision by the Korea Baseball Organization (KBO) hints at the possibility of picking at least some amateur players for the quadrennial event. 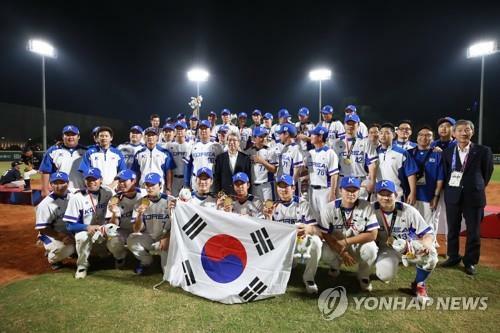 At the recently concluded Asian Games in Jakarta, South Korea won its third straight gold medal by defeating a Japanese team of amateurs 3-0 in the final. 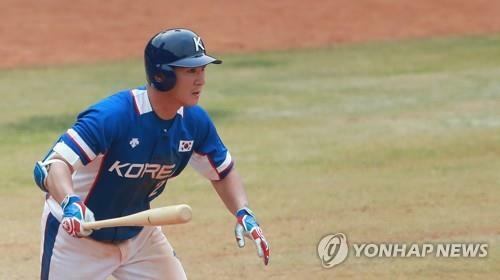 Baseball joined the Asian Games in 1994, and professionals were allowed to play starting in 1998. South Korea has been the only nation to field teams of almost entirely professionals at every Asiad since. The next Asian Games will be in Hangzhou, China, in 2022. At recent Asian Games, South Korean teams have faced criticism for allowing undeserving players to use the national team as a ticket out of the mandatory military service. While all healthy men must serve about two years in the armed forces, athletes who win an Asian Games gold medal earn exemptions from conscription. This year’s team, in particular, was an unpopular champion because of manager Sun Dong-yol’s controversial roster picks. Backup shortstop Oh Ji-hwan, who hadn’t completed his military service when he was selected, became the poster child for problems with Sun’s squad. Oh, who was leading the KBO in errors and strikeouts before the start of the Asian Games, made only three plate appearances as a pinch hitter in South Korea’s six games, and batted 1-for-2 with a walk and two runs scored. Even though Sun had previously insisted he would pick versatile players who could cover multiple positions on the field, the manager still went with Oh, who can only play shortstop. Disgruntled fans said seldom-used athletes like Oh don’t deserve military exemptions and argued that the KBO should stick to picking the best players possible, regardless of their military status. To that end, the KBO, which governs professional baseball, said it will work closely with the Korea Baseball Softball Association (KBSA) to revise the national team selection rules and process. If the KBO regular season doesn’t stop for the Asian Games in 2022, it likely means the national team will include a mix of amateurs and young, fringe KBO players whose absences wouldn’t have much bearing on the pennant race.